The real estate market in the big cities are drying up, those who are trying to sell their property are having a very difficult time. Prices are just to high for many, and the sellers are beginning to lower their prices. The economic was pumped by the [CB], but now it is on life support. Trump has cornered the [CB]s, not just the Fed but all [CB]s, they have no where to turn which means when the system comes crashing down the blame will be on them. Elizabeth Warren says Trump will be in prison by 2020, is she projecting. NJ is about to implement a rain tax. Adam Schiff begins to project that the Mueller report will show no collusion. 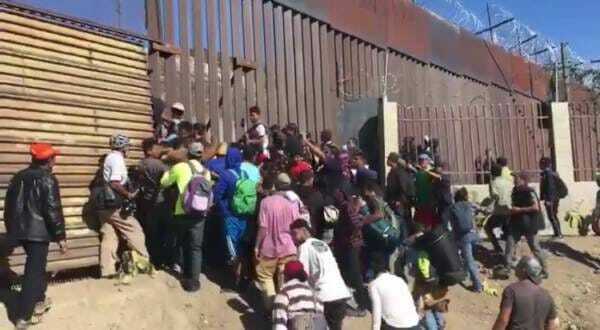 Gallup indicates that illegals are waiting to make their move on the US border. Ninth Circuit court rules in Trump’s favor regarding the border wall. Acting Defense Secretary is in Afghanistan talking about peace. Q drops more bread, hints that power will return to the people. Voter Id is in the works. The MSM is losing the control over the narrative. The wall has brought public awareness to the what the [DS] is all about. In Manhattan, 56% of the homes listed in March, April, and May 2018 have not yet sold. What makes buyers reluctant are the price declines. The StreetEasy median price index for Manhattan, at $1.132 million in December, is back where it had been in September 2015. 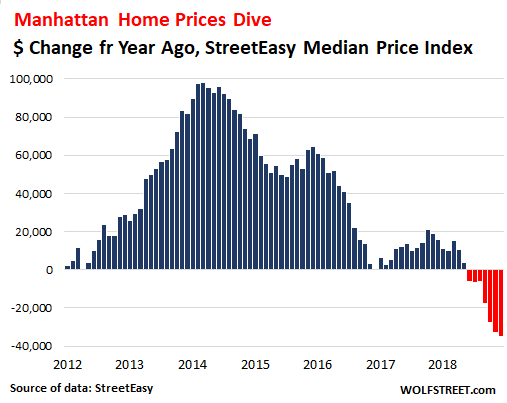 For the past six months in a row, the median price index for Manhattan has fallen below the same month a year earlier. These are the first such year-over-year declines since Housing Bust 1. Fake Indian Elizabeth Warren made an appearance in Cedar Rapids, Iowa on Sunday to kick off her 2020 presidential campaign. “The American people will reject her dishonest campaign and socialist ideas like the Green New Deal, that will raise taxes, kill jobs and crush America’s middle class. Elizabeth Warren is a fraud and used her fake Native American heritage to advance her career. 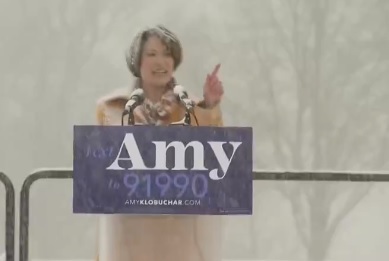 Democrat Senator Amy Klobuchar announced her run for President Saturday during a blizzard in Minnesota. She made global warming a major piece of her platform and announcement. It was 8° in Minneapolis on Saturday. And it was a blizzard. Gov. Phil Murphy had already brought the state into the ninth circle of taxation hell with new taxes to save the state’s ailing pension system, middle class voters in one of the least affordable states in the country have now been given one more thing to complain about: A tax on the rain. These newly created arms of local bureaucracy would be empowered to charge property owners a fee based on the amount of non-permeable surface they own (think: parking lots and driveways). The logic behind this is that non-permeable surfaces create runoff when it rains, and that runoff gets polluted as it travels from these surfaces into local sewers, and then on to the state’s water ways. The revenue generated by these taxes would be used to upgrade the state’s storm water systems, and save the state’s already polluted waters from further pollution (though the state would step in and scoop up 5% of all revenues). Last Thursday, Alexandria Ocasio-Cortez unveiled her radical ‘Green New Deal’ plan on her website. The 14-page wishlist also included a plan to transition to all electric cars and completely eliminate airplane travel — because trains over the ocean is a genius idea! The DS already knows the Mueller report will show absolutely nothing, Schiff is already preparing the narrative by projecting this. We need to remember dems [ds] placed Mueller in this position and now they don’t like that their guy didn’t find anything, This is why they moved the investigations to the house to create another firewall and to protect themselves. Snake Plissken tweeted out something very interesting and shows walls do work. The #GRAMMYs has fences blocking off several streets to protect a bunch of famous ppl who are mostly against 45’s wall that will keep this Country safer. I thought walls were immoral? So everyone has to be inconvenienced because these lefty elitists want to have a private party? 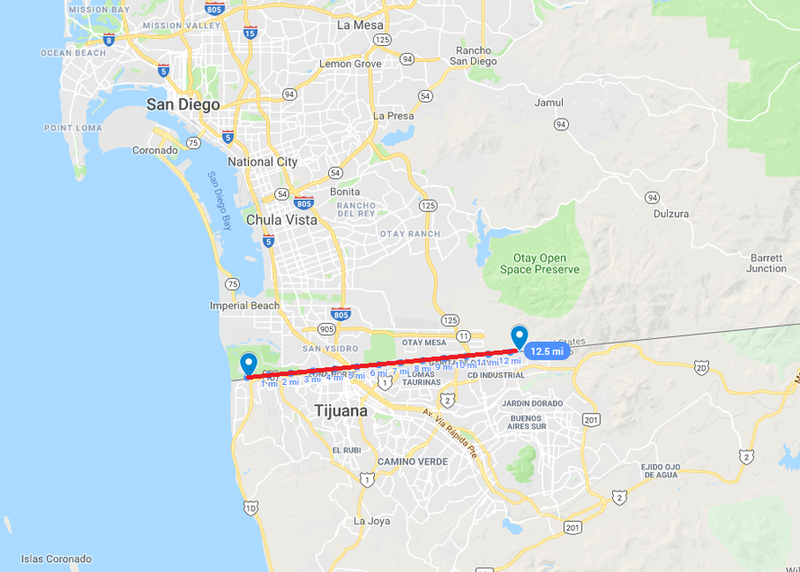 The Trump administration notched a 2-1 decision allowing expedited construction of a prototype wall in San Diego and replacement of 14 miles of existing “fencing” near San Diego. The U.S. Court of Appeals for the Ninth Circuit, a frequent target of President Donald Trump’s barbs over alleged bias against the president, sided with the administration Monday in a ruling greenlighting construction of a prototype wall and repairs to existing barriers along the California-Mexico border. The Trump administration notched a 2-1 decision upholding U.S. District Judge Gonzalo Curiel’s order finding the Department of Homeland Security did not exceed its authority by waiving environmental laws to expedite construction of a prototype wall in San Diego and replacing 14 miles of existing “fencing” near San Diego. 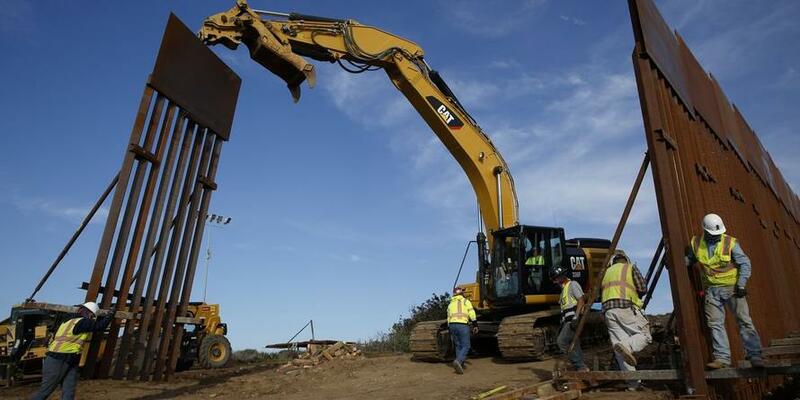 The Department of Homeland Security said in a Friday press release that they have issued a waiver “to ensure the expeditious construction and replacement of approximately 12.5 miles of the secondary wall” in San Diego. “The approximately 14-mile bollard style wall project in San Diego that was awarded by the U.S. Army Corps of Engineers on December 20, 2018, will include an area that begins near the eastern end of Border Field State Park and extends east to where the existing primary pedestrian fence ends,” reads the release. There were over 38,000 illegal border crossers arrested by the San Diego Sector border patrol in 2018, while 18,500 have been apprehended so far this year – an increase of more than 69% for the same period last year, according to DHS. Acting Defense Secretary Patrick Shanahan arrived in Kabul today, the first stop in a week of travel that will also take him to NATO headquarters in Brussels to discuss with alliance defense ministers the state of U.S peace talks with the Taliban and President Trump’s desire to withdraw thousands of American troops from the NATO-led mission currently supporting the Afghan security forces. hat’s because he asked permission to meet Vekselberg, the head of Skolkovo, and Arkady Dvorkovich, a senior official of Rosatom, the Russian nuclear giant seeking State’s permission to buy Uranium One, a Canadian company with massive U.S. uranium reserves. Why do D’s push to fund [PP] using taxpayer dollars ($500m/year)? Why is there a new push by D’s to legalize late term abortions? This has nothing to do w/ a woman’s right to choose (tactic they deploy when challenged to activate liberals/media hysteria). Cecile Richards cut her teeth in Washington, D.C., as deputy chief of staff for House Democratic leader Nancy Pelosi.Since 2006, she has been president of Planned Parenthood, a New York-based organization she is repeatedly tasked with defending against conservative detractors. Given the amount of evidence demonstrating illegal & disturbing activities by [PP]– where is the FBI investigation? Acting Attorney General Matthew G. Whitaker and Secretary of Homeland Security Kirstjen M. Nielsen yesterday submitted a joint report to President Donald J. Trump evaluating the impact of any foreign interference on election infrastructure or the infrastructure of political organizations, including campaigns and candidates in the 2018-midterm elections. Although the specific conclusions within the joint report must remain classified, the Departments have concluded there is no evidence to date that any identified activities of a foreign government or foreign agent had a material impact on the integrity or security of election infrastructure or political/campaign infrastructure used in the 2018 midterm elections for the United States Congress. Why do D’s push for NO VOTER ID in U.S. elections? Why do D’s push for OPEN BORDERS? No voter ids mean that illegals can vote, they need the open borders to bring illegals into the country to vote. The Supreme Court on Monday upheld a tough state law requiring voters to show photo identification, a decision critics say could keep some blacks, poor people and other traditional Democratic supporters from voting in the November election. the country’s high court voted 6-3 to reject a legal challenge by Democrats that Indiana’s toughest-in-the-nation voter identification law would deter minorities, the elderly and others from casting ballots. The main opinion agreed with Republican supporters that the law was necessary to prevent voter fraud and safeguard public confidence in the integrity of elections. The Bush administration supported the law. The law requires a government-issued photo ID such as a driver’s license to vote in federal, state and local elections. What (FALSE) ‘narrative’ is pushed by D’s re: VOTER ID LAW? Should an ID not be required at all (for any reason) given the argument made by D’s? If the SC ruled in 2008 that VOTER ID laws do not impact/harm or prevent ‘minorities’ from voting, how could the U.S. 4th Circuit Court rule opposite? Why do D’s want POWER at all costs? The senate was the target why? Does the argument ‘A NATIONAL VOTER ID LAW would suppress the minority vote’ suggest minorities are incapable of obtaining an ID? A federal judge ruled on Friday the US government can include citizenship question on the US Census.